Riga Castle (or Riga Pils) was built in 1330 on the site of the original settlement of the city as a residence for the master of the Livonian Order, and later it served as the base for the city's occupiers throughout its history. 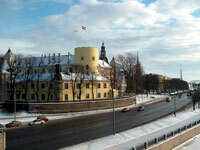 The distinctive yellow castle was destroyed and rebuilt over time, and today it serves as the offices and home of the Latvian president, as well as the Latvian Museum of Foreign Art and the Rainis Museum of Literature and Art History. The castle is strategically placed on the banks of the Daugava, originally in order to oversee all ships entering the city's port, and has four towers and an inner courtyard.